Randells have many years experience in servicing and repairing agricultural, garden and horticultural machinery. 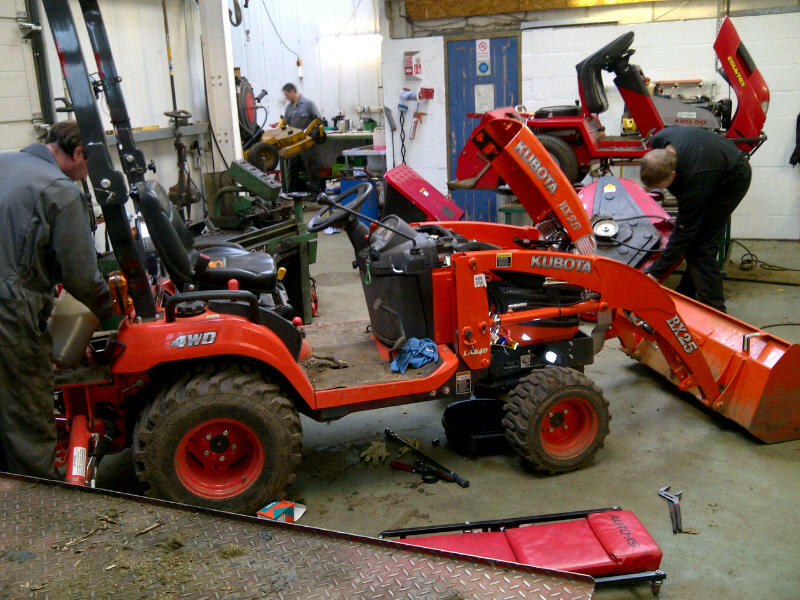 Our modern, well equipped workshops at Norwich Road, Horstead and Hillside Nurseries, Toftwood, Dereham prepare new and used equipment for sale as well as providing full servicing and repair facilities. We provide full warranty support for every new machine that we sell. At both Horstead and Toftwood we service and repair all types and most brands of domestic and professional lawn mowers and grass cutting equipment. We can also maintain other types of horticultural machinery including most makes of brushcutters and strimmers, chainsaws, compact tractors, cultivators and tillers, chipper/shredders, and hedgetimmers. We also have facilities to sharpen blades of cylinder mowers. Recently, we have expanded the service we offer to chainsaw owners and can now offer chain replacement and sharpening services for all major brands, including Stihl. We are main dealers for Echo and Mitox chainsaws. We offer a collection and delivery service throughout Norfolk and the Waveney Valley of Suffolk for larger items of machinery. In addition, we have a fleet of fully equipped vehicles enabling our engineers to carry out some repairs at our customers premises. Smaller items such as rotary mowers and hand held equipment may be brought to us by customers. We offer competitive fixed price servicing rates for Ariens, Countax, Mountfield, Kubota, and Stiga ride on mowers which include all service parts, oils and VAT. We service these excellent brands to manufacturers maintenance schedules, using genuine parts. Our aim is to provide customers with a clear understanding of our service costs. Any repairs found to be needed in addition to service work are not undertaken without our customers permission. Our ride on mower servicing costs are from £149.00. Walk behind mower services are from £60.00. Both our branches are Service Link registered garden machinery centres and we were presented with Mountfield's Award for Excellence for providing outstanding service in 2012. Our recently expanded workshop at Toftwood has facilities for us to service and repair agriculture machinery in a central location of Norfolk. We specialise in Vaderstad equipment and can also service and repair a wide range of other agricultural machinery, including tractors. We have particular experience with Valtra tractors.